Texas is full of amazing bars -- plenty of which qualify as good times bars. You know a good times bar the second you step inside for a drink -- whether it’s the tunes, the vibes, or the crowd, when you find a good times bar, you know you’re going to have a memorable night. We’re here to make sure the next time you head out in the Lone Star State, you find just the right place. These Texas bars are guaranteed to show you a good time. Friendly Spot is just that: a friendly, open-air bar frequented by San Antonio locals and their equally-friendly dogs. Because of that, it feels like you’re in a neighborhood backyard: complete with a big inflatable screen that’s always playing a movie (or a Spurs game) and retro lawn chairs. Oh, plus a beer list with 300 options and homemade sangria. You’ll never find a more restive hive of fun and thrillery. Housed in an unassuming, almost ramshackle building on a corner lot just off St. Mary’s Strip in Tobin Hill, Attagirl is the kind of bar you wish was walking distance from your house. It has the feel of a much older establishment, the kind of neighborhood joint you use as a landmark when orienting yourself or giving directions. Launched in the spring of 2015 following the success of Chris Cullum’s Attaboy food truck, dog-friendly Attagirl is a classic icehouse with eclectic music, a laid-back vibe, and bar food that is anything but an afterthought. The chicken and waffles and fried bologna sandwiches have a cult following, but it is Attagirl’s smoked wings, with different flavors featured every day, that push folks from satisfied into full-on sated. The menu of craft beers is thoughtful, substantial without being overwhelming, and fluid enough to ensure that there’s always something new to try that will match your mood, your wings preference, or the season. If the weather cooperates, consider trying Attagirl’s brunch for a true Sunday Funday. Anyone opening a San Antonio newspaper on December 5, 1933, would have been greeted with a banner headline announcing the end of Prohibition. 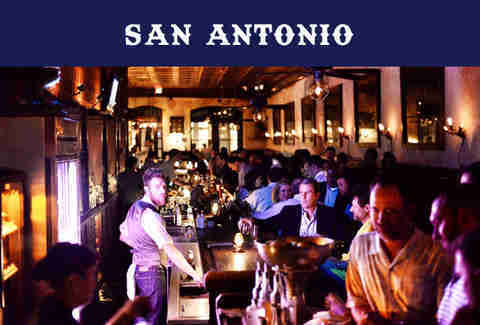 In related news, the termination of that long, painful dry spell was being celebrated with the opening of a new bar overlooking the San Antonio River. Today, The Esquire Tavern still welcomes thirsty patrons and, with its dark wood bar and banquettes and pressed-tin ceiling, feels a lot like it probably did when it was brand new. But while The Esquire is a bonafide Alamo City institution, it has never been content to become a dusty relic, flocked to by tourists who are drawn by its history alone. Instead, it remains just as relevant as any of the city’s newer, flashier lounges and bars, thanks to an impressive house and classic cocktail menu, a dozen local beers on tap, and a fun and varied food menu that includes special touches such as its house-made pickles. Unique as well in its appeal to both tourists and locals alike, The Esquire is a bar for all seasons -- cozy and inviting when there’s a chill in the air, and a cool, dark oasis during our muggy summers. A bar featuring over 20 local craft beers on tap and vinyl for sale may sound like the ultimate den of hipsterism, but don’t go running. The attention to detail put into Off the Record's offerings makes it simply a great bar for anyone who enjoys sampling the newest beer offerings or considers themselves a bit of a music nerd. 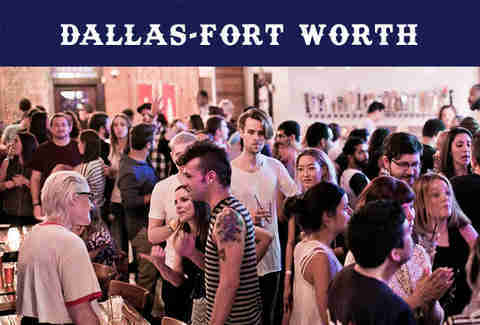 The thousands of records on offer are a selection curated by Dallas's own Good Records and there's an almost nightly schedule of DJ events, podcast recordings, and general vinyl nerd-out sessions. While you're perusing the latest offerings in indie rock, hip-hop, and vintage vinyl, you'll be able to sip seasonal beers from local breweries. There is no shortage of good bars in the upscale environs of North Dallas -- especially within the bustling Knox-Henderson and Lower Greenville districts that serve as a nightlife playground for SMU students and the city’s young professionals. But the gastropub Victor Tangos stands out in this crowded field for its expert staff, innovative cocktails, and a bar/restaurant dichotomy in which both aspects are equally strong. Tangos is as pretty (on the inside, at least) as you would expect a Highland Park-area bar to be -- cool and dark, with a bar that spans the length of the room and closely spaced tables that usually host a lively, elbow-to-elbow crowd. Despite its ritzy address, Victor Tangos is welcoming and fun. Of course, no matter how visually appealing the atmosphere and attentive the bartenders, nothing is as important as what’s on the menu; fortunately, Tangos is pretty close to perfect here as well. Food standouts include the duck and goat cheese flatbread and the divine warm toffee cake; on the cocktail side, the Chi Chi Rodriguez charms with its mix of tequila, blackberries, mint, pineapple, lemon, and cane sugar. But regardless of what you’re hungry or thirsty for, you can’t go wrong. 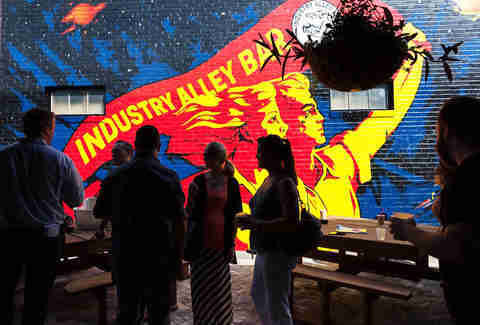 Founded by longtime local bar legend Charlie Pap, Industry Alley is not likely to be offering gently infused craft cocktails and the term "mixologist" is definitely one that you'll want to leave at home when you enter this bar. Located on the edge of the burgeoning Cedars, the drinks match both their proprietor as well as the aesthetics of its surroundings. Sure, you can request something with muddled mint and garnished with delicate flower petals. But you'd be missing out on one of the best Old Fashioneds that this town has to offer. Industry Alley is truly that. The kind of bar that industry veterans and folks who just enjoy a stiff and honest drink go to chat with neighbors and total stranger alike. In old west Austin you'll find the last remnant of life before the tech companies moved in. 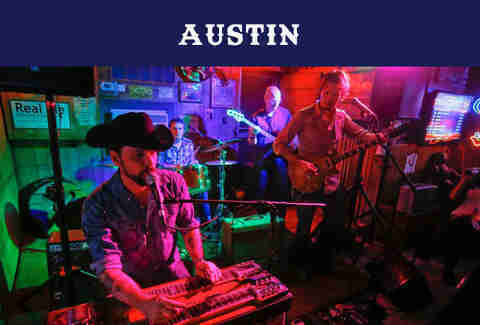 Deep Eddy has fifty-cent games of pool, six-dollar pitchers of beer with frosted mugs, and a jukebox full of honky-tonk classics to insulate you from the rest of the city. Considering born and bred Austinites feel like there's a siege on their beloved hometown, Deep Eddy is like the last bunker standing. The joint's size is limited which lends to the family atmosphere, so be prepared to engage in conversation with a bearded, 70-something Austinite with stories to tell. When you're done conversing, try your hand at an old-school Pac-Man game. 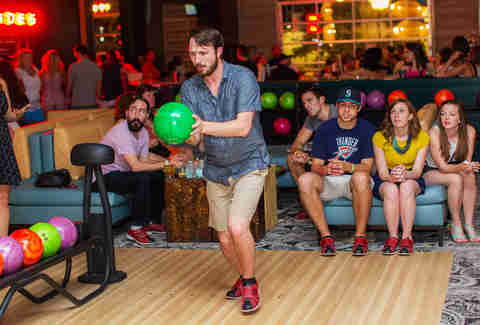 If you're good enough, a crowd of regulars might surround and watch you try to beat their record. Best part of it all? Magnolia Cafe is directly across Lake Austin Blvd. So go drink beer and dance to honky-tonk until closing time and wash it all down with Mag Mud at Magnolia. That's an Austin night. 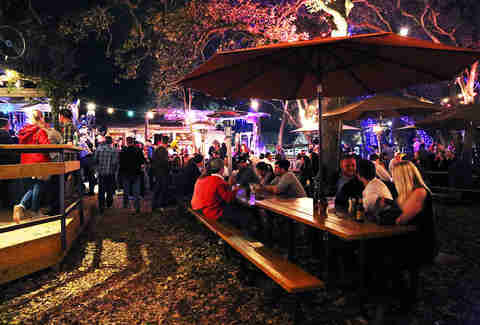 What were once a few acres on a 1950s ranch in South Austin are today one of the favorite neighborhood hangouts: Moontower Saloon, the best backyard in Austin. Hang out under a shady oak while you sip on a brew, listen to a live band, or grab a bite from a food truck. We suggest “deez lugnuts”: bacon-wrapped, deep-fried, pepper jack cheese bites from the Triplewide truck, too. Punch Bowl Social is not serving up the “punch” from your college dorm days. Nope, this old-school-arcade-meets-karaoke-bar-meets-bowling-joint has mixed punches that include ingredients like blackberry elderflower liqueur and coconut chai tea. And while the vintage games may please your leisurely side, the food menu’s got plenty of indulgences to excite you, like wagyu cubed steak and St. Louis ribs. How can you not have a fantastic time whilst drinking for a cause? Trick question. You can’t. Wait, we mean you can’t not. Whatever. Housed in an old 1882 casino saloon (look up! 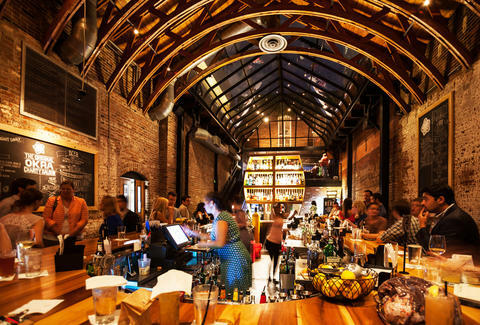 The original barrel-vault ceilings are still intact), this handsome bar looks even finer when you realize it donates all of its proceeds to a different charity each month. Beauty and character? How refined! Here’s how it works: You order a drink at the bar. The supercool bartender also gives you a ticket to vote on one of the 4 not-for-profit charities that are competing to win that month. The charity with the most votes at the end of the month gets ALL THE MONIES. You feel great, the charity feels great, the bar feels great, and basically, everybody wins. Even when Downtown gets sleepy (as it has been known to do from time to time), you’ll still find a crowd happy houring for charity. It’s a beautiful thing. If you want a bar that screams TEXAS! -- or one that most accurately depicts the mishmosh that is Houston, rather -- this is it. The Ice House has been open since 1928, before refrigeration was an “it” thing, and though it may not look like much to the naked eye, its bare bones conceal something truly special. You’ll have to visit to fully understand. When you do, you’ll be met by a cheerful crowd of locals coming from all walks of life; hipsters, frat guys, bikers, hell, even the Lululemon gang, all hanging with their dogs and sipping ice cold brew in harmony at shaded picnic tables. The bar rocks a strong roster of craft brews to keep you quenched, plus horseshoes, a basketball hoop, and what is widely considered the best taco truck in Houston selling $2 tacos al pastor parked right across the way. The icon is a throwback to better days, and it’s always a choice spot for good times. If you’re looking for a trendier crowd but refuse to admit it, this Montrose gem is the haunt for you. Poison Girl (or PG as some locals call it, which is ironic because it’s anything but PG) is a Houston locale where patrons have no problem going alone sipping their American Whiskey on the rocks, but are just as accommodating for whoever might scoot up to the bar or table next to them. Odds are if you made it to the same spot, you either love or hate the same things. You’ll have plenty to talk about -- like your favorite whiskey (while recounting PG’s extensive whiskey menu together), your preferred ink spot just a few blocks up, or blissfully making fun of the $30,000 millionaires a few blocks over in Midtown. The laid back and easygoing crowd vibe extends to everyone, including those behind the bar. 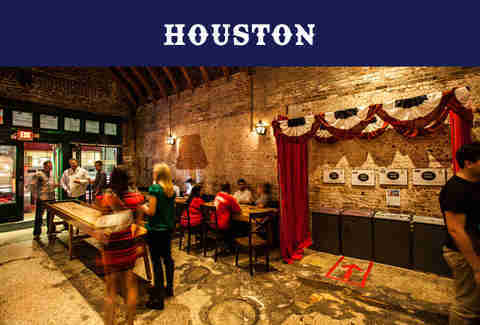 Probably the least pretentious place you can visit in Houston, all at a great price. During the hot months of Houston (so basically all year long), the only thing that will quench your thirst are the frozen drinks and liberal jukebox at Under the Volcano, located in Rice Village. A spot that can accommodate even the most discerning drinkers, dancers and partygoers, you’ll find a new reason to love it each time you visit. Try a frozen screwdriver or any of their other specialty drinks (which are always changing, depending who’s manning or womanning the bar) and their Standout Sangria is reason enough to come back. In 2012, Garden and Gun Magazine named this one of the 50 Best Southern Bars and it’s gotten exponentially better since the accolade. Although their calendar of events is ever-changing, be sure to check out steak night and any night featuring live music. This place will teach you to love Houston in a whole new light. No matter how much downtown Houston gets revitalized, this tavern will remain just that – a tavern. You won’t see anything fancy here and the patrons and staff continue to pay homage to being the oldest “haunt” in all of Houston, having been around for 125+ years. The small and cozy La Carafe is more reminiscent of what you’d find in New York City or New Orleans (thanks to their eclectic jukebox that will bring a smile to your face with each and every tune) than downtown Houston, but perhaps that’s half the charm. And likely one of the reasons it’s lasted more than a decade and continues going strong. 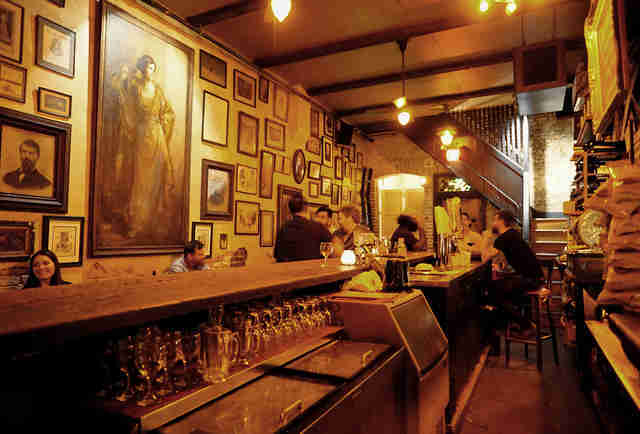 Speaking of old-timey charm – La Carafe is beer and wine only and even more impressive – cash only. You’ll get a kick out of their antique cash register that chimes each time you pay your tab. This Houston landmark is well worth the visit to an ATM, no matter how long the line. As Houston’s downtown gets trendier by the minute, it makes this place stick out like a not-so-sore thumb. It’s great for people watching, meeting new friends, or just avoiding the douchey ones around the corner.